This is the last of a series of articles on renal function, the nephron, the vasculature of the kidney, the importance of nitric oxide, the multiple and opposing roles of the NOS isoforms in kidney function, and the impairment of renal function in acute and chronic disease. The first section notes the embryonic recapitulation of the evolution of the kidney in the emergence of oxygen dependent species from the deep oceans and swampland to a lung breathing and terrestrial existence. The excretory kidney that all mammals rely on for elimination of nitrogenous wastes, mainly composed of urea, is a metanephric kidney that develops in the fifth week of human embryonic life. The kidneys are paired organs capped by the adrenal glands that lie in the lower posterior abdominal wall supplied by the renal arteries that branch from the aorta. The kidney has grossly and outer cortex that surrounds the medulla. The cortex is highly vascular containing all of the glomerular structures that receive circulation from an afferent arteriole and return circulation by way of an efferent arteriole. The efferent arteriole can become thickened by sustained high pressure. 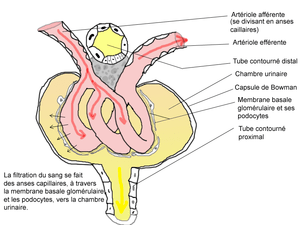 The glomerulus has a globular structure with a double membrane through which no cells pass, but the plasma is filtered, gaining entry into the tubular nephron. With aging there can be a loss of half of the original nephrons, but the measurement of significant loss is not necessarily measured as decreased glomerular filtration rate (GFR)(120 ml/min) until a loss of 1/3 to 1/2 of kidney mass. The metanephric kidney requires passage of large amounts of fluid volume. The cortex is high-energy and high mitochondrial content because of its concentrated circulation and the pressure need to drive filtration (passive). The next phase of urine formation begins in the cortex, in the proximal convoluted tubule, with the filtrate passing into the descending limb, in which there is active reabsorption of glucose by a transporter, exchange of Na/K by Na/K ATPase, excretion of urea and secretion of uric acid, and regulation of pH by carbonic anhydrase. This is not in itself sufficient to manage the formation of urine that is concentrated, contains nitrogenous waste, and returns key analytes to the circulation. The medulla contains interstitium, the tubular nephron that consists of descending limb, the Loop of Henley, ascending limb, and the collecting ducts that empty into the medullary pyramids. The interstitium develops a high pressure bacause of the concentration of Na that is pumped in proximally, and a volume of water that is removed from the adjacent distal end and the collecting ducts under the influence of antidiuretic hormone (ADH). When the circulation and the interstitial pressures are hypoxemic in the medulla, acute medullary necrosis ensues, largely the hallmark of acute tubular necrosis. When the kidney cortex becomes ischemic, partly as a result microthrombi in the arterioles and/or the glomerular capillaries, acute cortical necrosis ensues. The second section is a description of the role of nitric oxide (NO) in renal function. The earliest concern was focused on the NO and eNOS in the cortex, with the rich vascular bed. The generation of NO by eNOS is essential for vasodilatation. Then, far more interest lie in the role of NO in tubular and interstitial function. The tubules are exposed to large changes in fluid flow pressures and to ionic stresses of the adjacent interstitial tissue. The interest was catalyzed by the wartime crush injuries that led to acute tubular necrosis with an initial 80% mortality, tht has been improved by fluid resuscitation, with caveats. Nitric oxide (NO) and its metabolite, peroxynitrite (ONOO-), are involved in renal tubular cell injury. However, while eNOS generated NO is beneficial, inducible iNOS generated NO is a large player in ATM. We learn that both forms have an important counter-balancing effect. NO/ONOO- has an effect of reducing cell adhesion to the basement membrane. It is not the NO, but the converted ONOO- peroxynitrite that has the most damaging effect. The damage to tubular epithelium does signal repair, but the damaged cells feed into the tubule and are precursor of Tamm Horsfall protein (TFP), which obstructs flow. The exposure to NO donor SIN-1 caused a dose-dependent impairment in cell-matrix adhesion, that was obtained in different cell types and matrix proteins. In a seminal paper, the authors concluded that ONOO- generated in the tubular epithelium during ischemia/reperfusion has the potential to impair the adhesion properties of tubular cells, which then may contribute to the tubular obstruction in ARF. N acetyl cysteine (NAC) given within the first 3 h posttreatment further delayed cell death and increased the intracellular thiol level in SIN-1 but not . NO-exposed cells but cell injury from . NO was independent of cGMP, caspases, and superoxide or peroxynitrite formation. Exposure of non-. NO-producing cells to . NO or peroxynitrite results in delayed cell death, which, although occurring by different mechanisms, is mediated by the loss of intracellular redox balance. The last section is the NO donors as therapeutic targets. IFNa produced dose-dependent and time-dependent decrease in transepithelial resistance (TER) ameliorated by tyrphostin, an inhibitor of phosphotyrosine kinase with increased expression of occludin and E-cadherin. Therefore, IFNa can directly affect barrier function in renal epithelial cells via overexpression or missorting of the junctional proteins occludin and E-cadherin. There is agreement that oxygen-derived reactive species are important in renal ischemia-reperfusion (I-R) injury. Treatment with oxygen radical scavengers, antioxidants, and iron chelators such as superoxide dismutase, dimethylthiourea, allopurinol, and deferoxamine are protective. They all directly scavenge or inhibit the formation of peroxynitrite (ONOO−), a highly toxic species derived from nitric oxide (NO) and superoxide. Thus, the protective effects seen with these inhibitors may be due in part to their ability to inhibit ONOO− formation. However, induction of inducible nitric oxide synthase (iNOS) and production of high levels of nitric oxide (NO) also contribute to this injury. NO can combine with superoxide to form the potent oxidant peroxynitrite (ONOO−). L-NIL administered to animals subjected to I-R significantly decreased plasma creatinine levels to 1.2 ± 0.10 mg/dl and reduced tubular damage. 3-nitrotyrosine-protein adducts were detected in renal tubules after I-R injury. Selective inhibition of iNOS by L-NIL decreased injury, improved renal function, and decreased apparent ONOO− formation. Therefore, reactive nitrogen species should be considered potential therapeutic targets in the prevention and treatment of renal I-R injury. NO functions to promote natriuresis and diuresis, contributing to adaptation to variations of dietary salt intake and maintenance of normal blood pressure. A pretreatment with nitric oxide donors or L-arginine may prevent the ischemic acute renal injury. In chronic kidney diseases, the systolic blood pressure is correlated with the plasma level of asymmetric dimethylarginine, an endogenous inhibitor of nitric oxide synthase. A reduced production and biological action of nitric oxide is associated with an elevation of arterial pressure, and conversely, an exaggerated activity may represent a compensatory mechanism to mitigate the hypertension. Adequate medullary tissue oxygenation, in terms of balanced oxygen supply and demand, is dependent on the maintenance of medullary perfusion by adequate cortical perfusion and also on the high rate of O2 consumption required for active electrolyte transport. The sensitivity of the medulla to hypoxic conditions results from high O2 consumption. Renal sodium transport is the main O2-consuming function of the kidney and is closely linked to renal blood flow for sodium transport, particularly in the thick ascending limbs of the loop of Henle and the S3 segments of the proximal tubules. The medulla has been found to be the main site of production of NO in the kidney. In addition to the actions described above, NO appears to be a key regulator of renal tubule cell metabolism by inhibiting the activity of the Na+-K+-2Cl- cotransporter and reducing Na+/H+ exchange. NO reversibly binds to the O2 binding site of cytochrome oxidase, and acts as a potent, rapid, and reversible inhibitor of cytochrome oxidase in competition with molecular O2. This inhibition could be dependent on the O2 level, since the IC50 (the concentration of NO that reduces the specified response by half) decreases with reduction in O2 concentration. The inhibition of electron flux at the cytochrome oxidase level switches the electron transport chain to a reduced state, and consequently leads to depolarization of the mitochondrial membrane potential. While the NO/O2 ratio can act as a regulator of cellular O2 consumption by matching decreases in O2 delivery to decreases in cellular O2 cellular, the inhibitory effect of NO on mitochondrial respiration under hypoxic conditions further impairs cellular aerobic metabolism. HIFs are O2-sensitive transcription factors involved in O2-dependent gene regulation that mediate cellular adaptation to O2 deprivation and tissue protection under hypoxic conditions in the kidney. The induction of HO-1 can protect the kidney from ischemic damage by decreasing oxidative damage and NO generation. Finally, in addition to its anti-apoptotic properties, EPO may protect the kidney from ischemic damage by restoring the renal microcirculation by stimulating the mobilization and differentiation of progenitor cells toward an endothelial phenotype and by inducing NO release from eNOS. 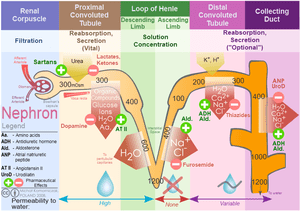 many other homeostatic functions in the kidney. We know that there is an unquestionable role of NO, and a competing balance to be achieved between eNOS, iNOS, an effect on tubular water and ion-cation reabsorption, a role of TNFa, and consequently an important role in essential/malignant hypertension, with the size of the effect related to the stage of disorder, the amount of interstitial fibrosis, the remaining nephron population, the hypertonicity of the medulla, the vasodilation of the medullary circulation, and the renin-angiotensin-aldosterone system. Dear Dr. Bernstein, thank you for this great series of articles posted regarding NO- fascinating!! Although not directly correlated to this post regarding renal function and pharmacotherapy, I wanted to add that there’s a growing interest of NO donor in vascular and plastic surgeries. As you mentioned above and in your following posts, Nitric oxide has a key role in vascular homeostasis. It plays a protective role by suppressing abnormal proliferation of vascular smooth muscle following various pathological situations including atherosclerosis and restenosis after vascular interventions such as balloon angioplasty, stent deployment and bypass grafting. It also has strong antiplatelet and anti-thrombogenic properties.Therefore, its applications to daily vascular and endovascular surgery practice are extensively being explored; including 1) systemic use of NO donors, 2) enhancing endogenous production of NO by L-arginine and gene therapy, 3) local delivery strategies and coating stents and 4) grafts with NO-delivering/enhancing chemicals. It is a very interesting and important topic influencing many aspect of patient Health. Please conduct a search on our site on Nitric Oxide. In January our first e-Book for Kindle will be completed. If you can write a post on a topic that is MISSING — please do. we have few posts on that by myself — 24 posts on stents !! 4) grafts with NO-delivering/enhancing chemicals. If you wish to create few posts on the above missing for the e-book, take it as yours four post in December and you will be a contributor to the book. Let’s focus now on A. only Grafts and B. C.
Thank you for this important comment and the opportunity to IMPROVE the e-Book in the last minute before the Press – some are born to make history, others are paving the major roads…. (selection of NO as first e-Book). I will do my best efforts to send you and Dr. Brenstein a post regarding NO donor on either systemic use or gene therapy (not much data on gene therapy though). Will e-mail you both when I have something in my hands. this is very interesting. I find it particularly interesting concerning the findings from the knockout mouse data, which shows how eNOS (constitutive NO production) is cytoprotective under periods of hypoxia. I also find it fascinating that eNOS is so expressed in the cortical highly vascularized region. This is particularly important given the vast gradient of blood flow, oxygen tension, and ion and acidity which occurs between the cortical and medullary region. Truly NO has such an important role to play in not only renal dysfunction but the normal physiology of the kidney and renal system. I wonder if other organs have similar patterns of enOS expression between their cortical and medullary regions (for example the ovary in which a massive angiogenic reorganization occurs). Thanks for the post! Many thanks for your mobilization to provide a new post on NO for the e-books which will close in December. I believe that we will be able to have Editions like with books. I suspect our e-Book will be the FIRST to edify the public at large on this matter — As a matter of fact this statement can be generalize on Nitric Oxide as an e-Book, all the posts are novel reporting, ALL in one place. It is the collection of posts and the forthcoming Table of Contents that subsume the VALUE ADDED contribution of the TEAM. We will replicate this model on the other five topics, I am starting to build the portfolio of posts on cardiovascular pharmacogenomics. It is so amazing what a gifted team, with creative guidance, can accomplish voluntarily — sheer professional maturity and excellence !! I’m reading this now, and I have put together additional material that I could not deal with, time not permitting. There are 3 organs that have dual circulations. I wasn’t taught that the kidney has a dual circulation, but the kidney medulla and cortex indeed have a critical structure that is systemic in the afferent arteriole, but there is a parallel circulation to the renal tubular structures that are involved with the countercurrent multiplier. 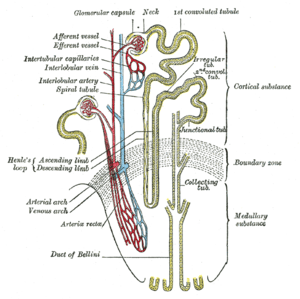 The blood leaves the kidney by way of the efferent arteriole. Efferent arteriolar sclerosis is a hallmark of hypertension. Afferent arteriolar sclerosis is specific to diabetes mellitus (insipidus unrelated). The effect of hypoxia is greatest in the medulla because of the dependency of the renal blood flow down from the cortex to the medulla. The cortex has a high reliance on mitochondrial energy production. The other two organs are the liver and the lung. The only role that the lung has is in gas exchange. Louis Gluck did the classical work on the lipid structure on pneumocytes in the lecithin/sphingomyelin ratio in lung maturation and hyaline membrane disease of the neonate. This is critical for understanding alveolar lung compliance. Adult HM disease occurs, but I don’t know if it is related to the mechanism in babies. I think that in severe lung perfusion disturbance the alveolar cell are destroyed and have to be regenerated, that might recapitulate the earlier phase in regeneration. This is really important physiology that ties in with NO and is neglected. There is nothing but gas exchange, affected by atmospheric pressure, lung compliance, pH, and capillary flow. The liver – 60% of the circulation is through the portal vein. It is very difficult to come up with infarct in the liver. One exception! Zahn infarct. We make a distinction between periportal necrosis and pericentral. HCV has a relationship to hepatocellular carcinoma. But the liver has such a large role in detoxification.